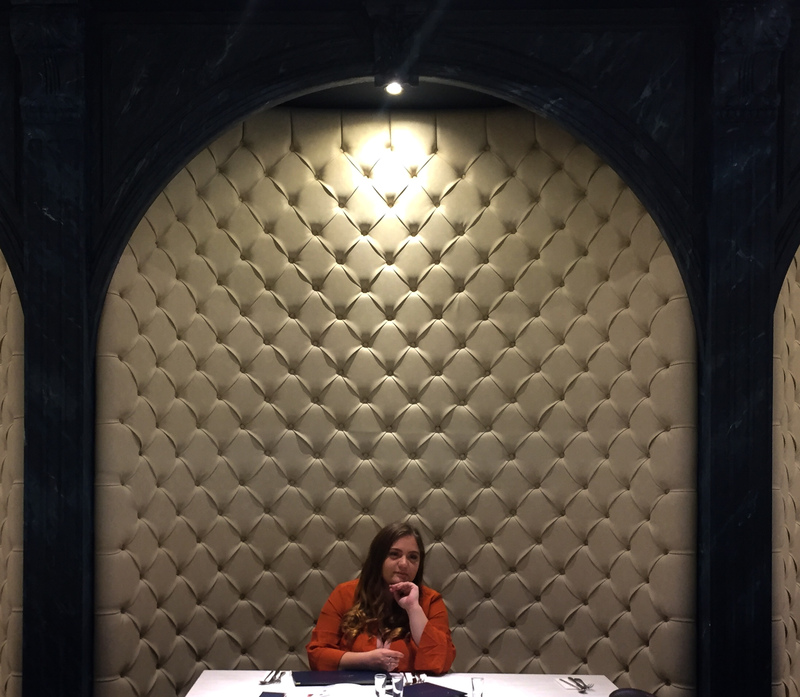 A week ago today, I was kindly asked to go and review a brand new dessert restaurant in Leicester; Haute Dolci. 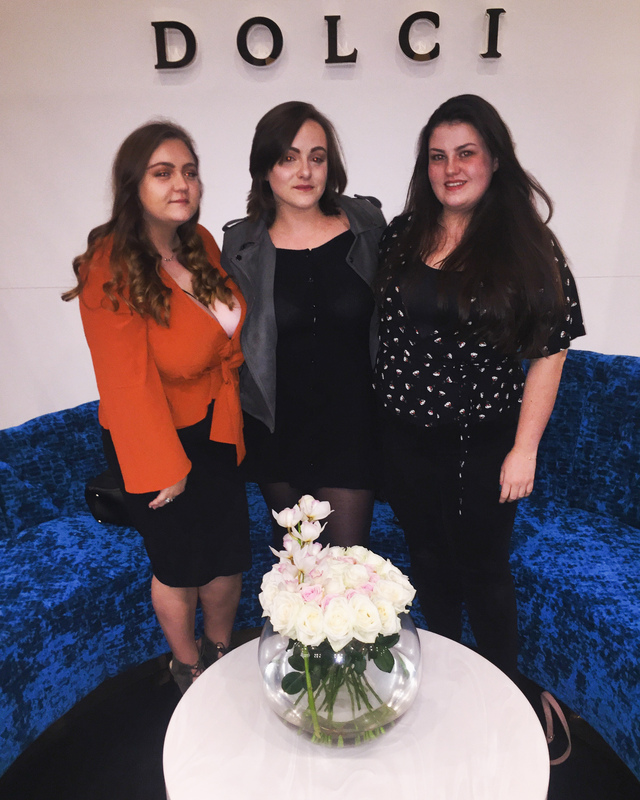 Officially opened on 29th September, they kindly asked if I’d like to go and review before their opening, so I got to take my housemates to an exclusive preview evening. We arrived and considered that we may be a little overdressed. However, when we stepped through the keyhole (aka door) we certainly did not feel it anymore; this place is amazing. 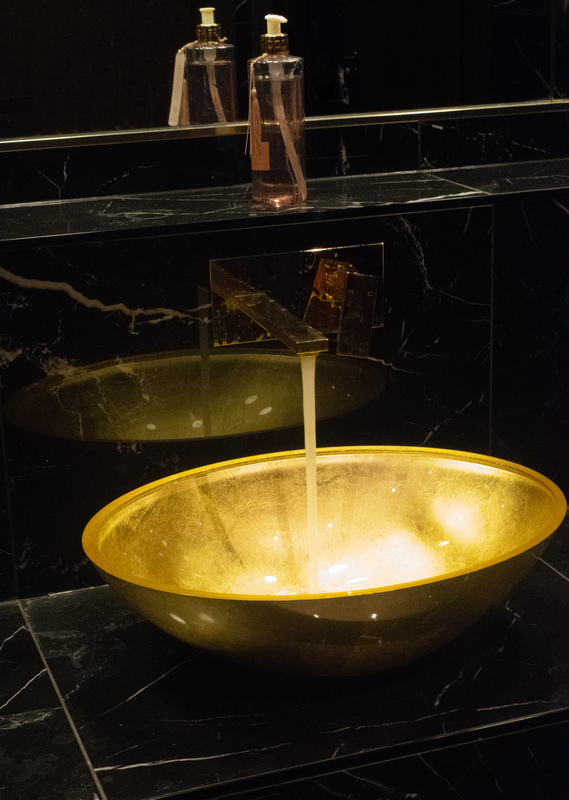 A blogger’s dream of velvet seats, golden thrones and CHOCOLATE TAPS(!! ), it certainly makes a breath-taking first impression. We were escorted to our table by a lovely guy (who’s name we can’t remember, oops), and assigned Shanez as our hostess for the night. I honestly couldn’t compliment Shanez enough; lovely to chat to, professional and helpful throughout! There was a little hiccup when it appeared that the restaurant were not aware about our review and complimentary meal, but this was soon resolved, apologies were made, and we could get on with our evening. 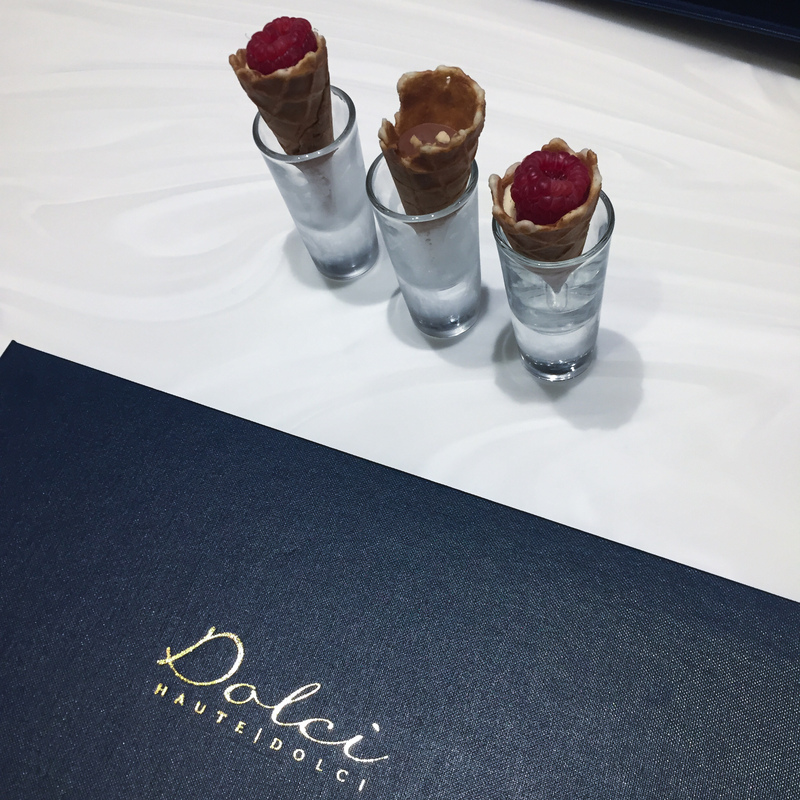 We were first brought a round of appetisers which were small ice-cream cones filled with chocolate and various fruits. These were definitely a lovely little start to our meal! Next, we ordered some drinks to the table. Emily and Charlotte (my housemates) both opted for a Spearmint Splash mocktail, whilst I opted for the Sticky Surprise coffee. We all really enjoyed sipping on these whilst we waited for our mains to arrive. We actually decided to order three main desserts between us, so that we could all try a little bit of everything. The desserts that we opted for were the Guilty Indulgence, the Lick Your Lips, and the Salted Caramel Cheesecake. The Guilty Indulgence was a strawberry and chocolate lovers’ dream. 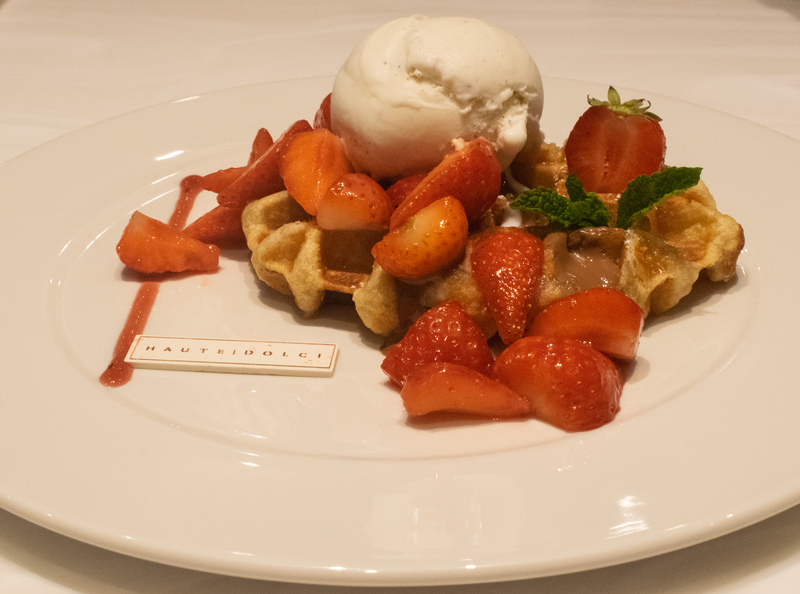 Crispy Belgian waffle, topped with strawberries, milk chocolate sauce and ice cream- we all were big fans of this dessert and would definitely opt for it again! Lick Your Lips certainly was the best brownie I have ever tasted- it was simply delicious! That’s definitely one to try if you’re a chocolate lover. 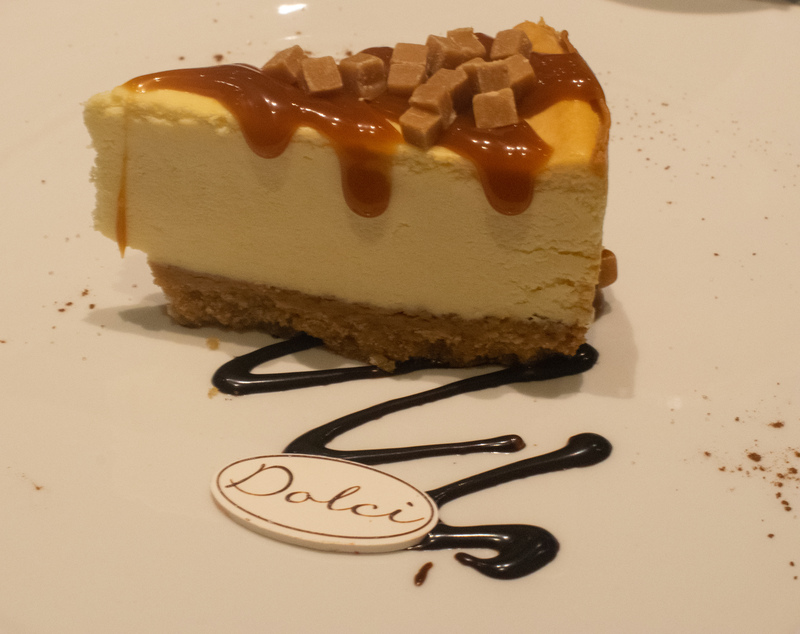 However, the Salted Caramel Cheesecake took the crown for the best dessert of the night for me. A perfectly fluffy cheesecake drizzled with a delightful salted caramel sauce- I honestly have DREAMS about it! I’ll definitely be back, and bringing Zack for a romantic date evening! 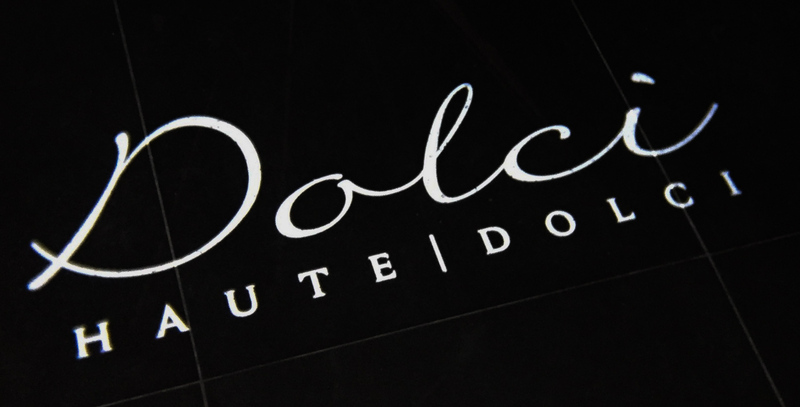 As well as offering a delightful dining experience, Haute Dolci also offer a VIP Private Dining Experience! We were told that there may be an extra charge for this, but as they are brand new they’re going to ‘test the waters’ for a while to decide the best option for this. 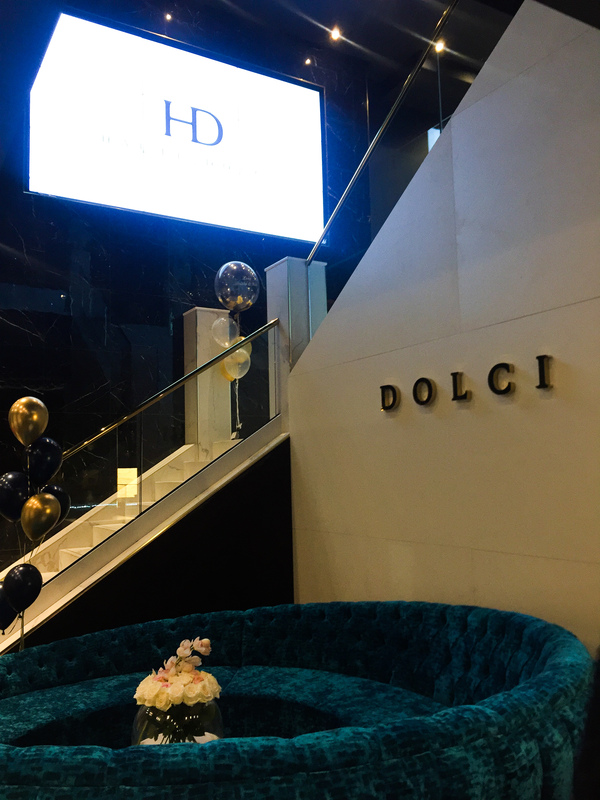 Currently, Haute Dolci spans one floor. However, plans to extend the dining areas to the top floor are in place! And, if that wasn’t already enough, we were told a little secret about plans to create a gourmet burger diner too.. So you can get a meal and a dessert in one truly unique experience! The only note that we had was that they don’t serve alcohol. This didn’t, personally, dampen my experience, but I thought it was something that I should include in this review. However, it is located in a great area for bars and pubs, so there’s definitely options for after your luxury dessert experience! I know what you must be thinking, but that place looks so expensive and fancy! It does, you’re right. 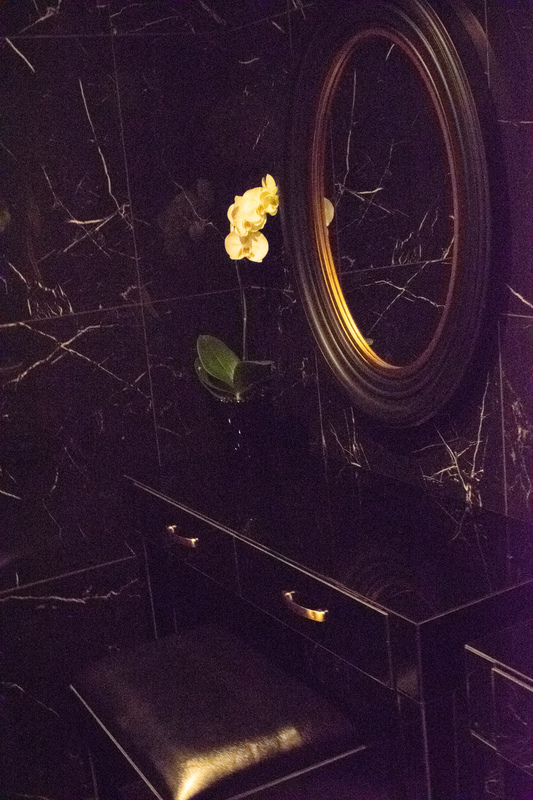 It looks very high end and classy, I mean the sinks are gold and the toilets are floor to wall marble. But, we were all very pleasantly surprised. 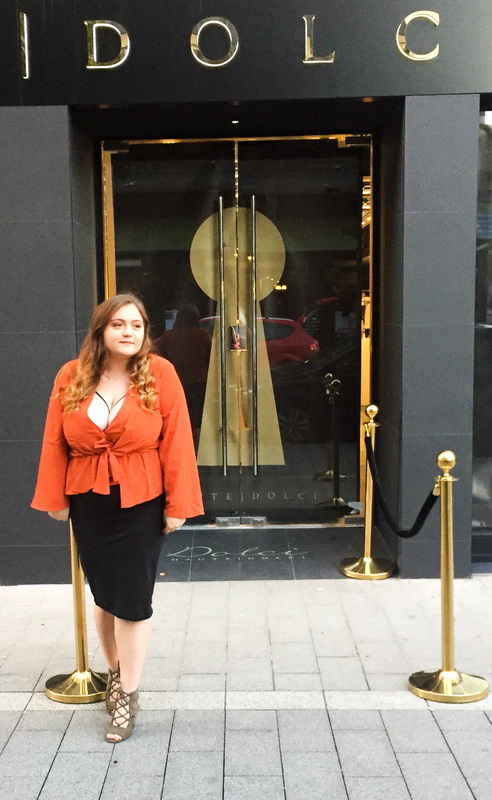 I have been to quite a few dessert restaurants in my time, and Haute Dolci is by far the fanciest and best experience that I’ve had, plus the food was delicious. But, the prices very reasonable; I would choose to go here every time! 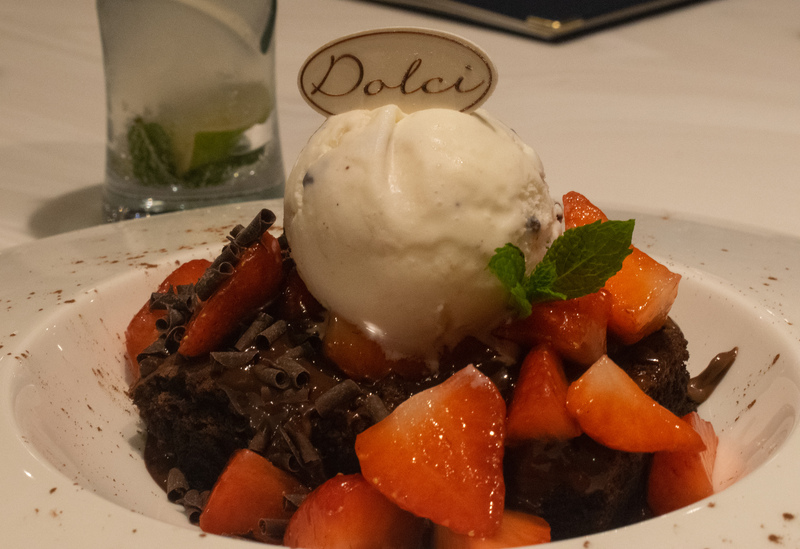 The staff at Haute Dolci told us that their aim is to create an experience. Fine dining for a fraction of the price, because everyone deserves to experience luxury. And, honestly, I can happily say that they succeeded. Emily says ‘it’s a boujiee atmosphere but regular eating prices’. Charlotte says ‘pretty sure it was one of the best things I’ve ever eaten! And the staff were so lovely’. 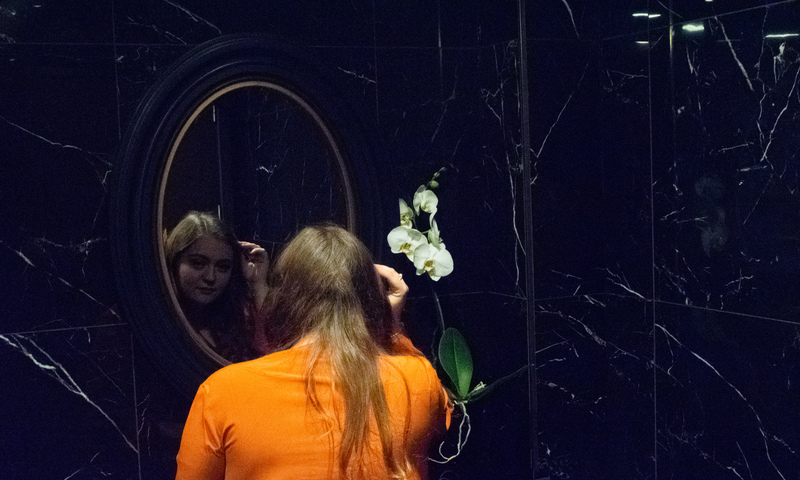 I’m very excited for the future of Haute Dolci. I can tell that it’s going to be a great asset to Leicester, and I already cannot wait to go back. Previous Post Weekly 2; My University Room Tour! !